In a previous post we discussed some of the facets of auctions that everyone looking to buy land at auction should know. But, as the post became rather lengthy I decided to break it up into two posts. This post will primarily deal with the pros and cons of land auctions for both the buyer and the seller. There are a myriad of both for either party, just as there are in any type of real estate transaction. I certainly can’t cover them all, but I will give you a few just to get you started. Let’s go through these one by one. The first is fairly simple. You can bid up to the point where you feel comfortable. There is no need to bid higher if you don’t feel the property has greater value. You also have the ability to bid less than what you might would have, if the other bidders cease bidding up. This open bidding process can be a blessing and a curse for both buyer and seller. Remember what I mentioned in the previous post on this article, set your max price and stick to it, but don’t feel bad if you’re able to walk out of there with the property for substantially less. Second is no worrisome details to get bogged down in. If you’re not a professional negotiator, you don’t need to feel intimidated by the other party or worry that they’re secretly beating you up on some aspect of the deal you don’t understand. At an auction, you say you’ll buy at $X price end of story. There are no details to worry about in coming to a price point. If you read my previous blog on this point and followed my suggestions, you already know what the property is and what you’re willing to pay, so by now its smooth sailing. This third point and the next are probably the two most important pros for buyers at auctions. Limited competition is a very real and very important factor that most often plays in the buyers favor at auctions. If they’re having an auction in Glascock County, GA and no one knows about it but you, do you think you might get a good price? In order for auctions to be truly successful from a seller’s standpoint they usually need to have a good turnout at the auction. A number of factors affect this in a positive way for buyers, thereby limiting competition. Poor marketing efforts by the auctioneer. Land is often located in rural areas, merely placing signs is insufficient. Mailings work but you have to know who to send them to for them to be effective. Finding buyer’s with sufficient cash is difficult and the terms under which almost all auctions operate sometimes limit the pool of possible buyers who can’t don’t have the cash or can’t obtain financing prior to the auction. Many buyers are intimidated by the auction process or lack the confidence to do the proper research on a property and thus will simply not bid. Poorly chosen dates, locations and even bad weather can reduce the competition. All of these factors may lessen the competition, which strengthens a serious buyer’s position at auction. Finally, and most importantly, is the opportunity for great deals. There are unquestionably some great deals to be had at auctions, just not at every auction. Buying land at auction, in some ways is like buying at a flea market. You never know what you’re going to get. Some booth’s are selling junk, some are selling good product that sell for high prices, and every now and then you find one where there are good deals to be had. The way most auctions are done, those who bring the most money typically get the best deals through combination bids. We have bought numerous properties through auction that we felt were very good deals. However, we probably have gone to ten times as many auctions where there were no good deals to find them. There are also some downsides to potential buyers at auctions. I’ll start at the top as before and go down the list. First up is that there is no due diligence period or inspection period after you sign the contract at auction, and typically there are no seller guarantees except good title. You must do your homework on any prospective property BEFORE you bid on it at auction. As the seller is usually making no guarantees, any defects or problems with the property become your problems once you close. This means you must feel comfortable in your ability to adequately research the property and determine any potential defects yourself, or you will have to hire someone with expertise in this area to do the research for you. Either way, you must be certain you know what you are bidding on or you may regret it later. Limited title also falls into this category as well, really. It is quite common at auction for seller’s to give limited warranty deed’s which only warrant the buyer for title issues which occur during the period the property is owned by the current owner. Any issues effecting title or the property done prior to their ownership is not warranted. As a result make sure you know the history of the property before you buy or you may be buying someone else’s headache. No Sales are extremely common and can be quite frustrating for those who do not have a good deal of experience with auctions. These happen during Auctions with Reserve. In essense, the seller has a reserve bid which may or may not be known before the bidding begins. If the high bid on the auction is lower than the reserve bid then the seller can reject the high bid and the auction will result in a No Sale. For those who are inexperienced they will often believe that when they are the high bidder they have the right to buy the property at the bid price, only to have their high bid rejected by the seller. This is all the more frutrating to the buyer as they typically have won with a smaller amount than they feel they would have had to pay in a traditional transaction. Be aware of what type of auction you are bidding in and don’t be surprised if you feel you’ve made a deal to good to be true, that it turns out you were quite right. 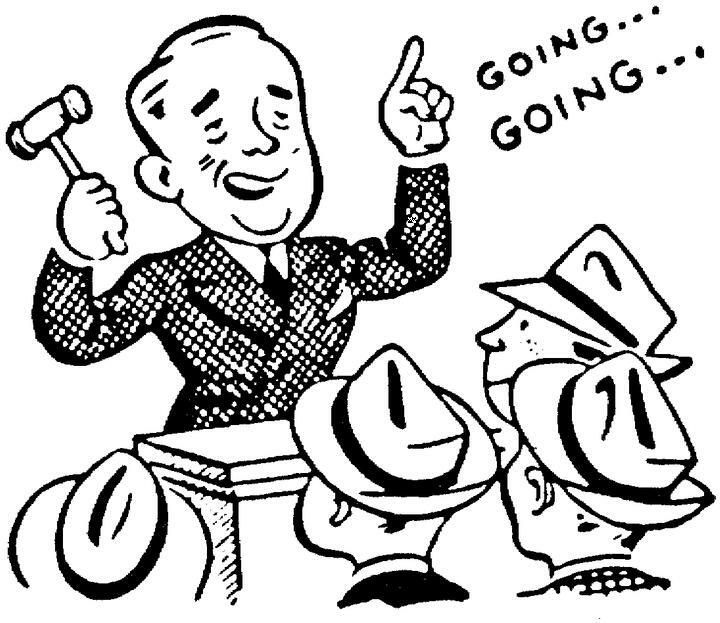 Another con to buyers at auction is a lack of knowledge about the bidding competition. At auctions, you will frequently be bidding against numerous other individuals. Oftentimes, these are individuals who are completely unknown to you. This can be a con for several reasons. For one, sometimes you can be bidding against someone who has no clue what they are doing. I am aware of one auction where two individuals were bidding on about a 500 acre tract on a price per acre basis. They went back and forth again and again until finally the adjacent landowner won out at a price considerably higher than the market would normally bear for this type of property. After the auction, it became apparent the losing party believed they were only bidding on one acre and had absolutely no capacity to buy 500 acres. Nonetheless, their actions at the auction caused the winning party to bid considerably more than they should have to acquire the property. Secondly, while it is illegal in Georgia, there is always the possibility of bidding against shills. Shills are individuals who are placed at the auction who have one purpose only, to get the bidding above an acceptable level to the seller. They are not real buyers, they are straw men used to get you to bid more than is necessary to attain the high bid. With the advent of internet bidding, this is an even more prevalent concern than before. There are often other costs associated with buying at auction that any prospective buyer should know. One is the buyer’s premium. On the vast majority of the land auction’s I have attended it is 10% of the high bid amount. The amount is negotiable between the seller and the auctioneer so make sure you know what this amount is prior to bidding. Remember you must tack this onto your high bid. For example, if your high bid is $1,000/acre and the buyer’s premium is 10% then you will be coming out of pocket $1,100/acre. Sometimes this buyer’s premium can push you from a good deal to a not so good deal, so be wary. Usually survey’s are also needed. This cost can be borne by whatever party is determined prior to auction. I usually see it split by the buyer and seller so this may be an additional cost you must bear as the high bidder. In a normal transaction a survey may or may not be required. be aware as these are all things which may effect your total out of pocket costs. The final primary con of auctions is that as a buyer, you must have cash or ready and certain financing prior to the auction. If you don’t, you might find yourself rejected for a loan and out the down payment required as a successful high bidder. This factor alone probably limits more potential buyers than any other at auctions. It also tells you that most of the bidders at auction are well heeled financially. This is why it is very difficult for many to be successful bidders at auction. If the deal is very good, there is usually someone there with loads of money waiting to snap up the best deals and leave you out int the cold. This is done in the combination phase time and time again. I see auctions where individuals have made good deals on 50 or 100 acres only to see themselves out bid in the combination pahse by some one bidding on 300 acres. So, if you’re planning on coming to auction make sure you have the financial backing to successfully compete and close. Know we’ve covered the pro’s and con’s for the buyers. So what about the sellers? For seller’s, one of the biggest pro’s is a known date of sale and a quick sale. More often then auctioneers or seller’s will ever admit, auctions are done for seller’s who have a real desire to get rid of a real estate asset. It could be because of financial trouble, judgements, divorce, or it could be an REO that a bank or lending institution is trying to liquidate. There are certainly some companies and individuals who use auctions as a normal course for selling real estate, but frankly, a lot of it is sold through auction because they need to unload it. having a known date of sale or a quick sale is very advantageous to someone in the need to sell their real estate due to distress. It allows them to plan more effectively going forward with an assured date of sale. Another pro is the lack of negotiation, just as it is for the buyer. This is one less thing to concern yourself with as a seller. You needn’t be intimidated or worried you’ll be haggled into giving up more than you’re comfortable with. You’re selling, they’re buying, end of story. Another huge benefit of selling at auction is that there are almost never any financing contingencies in auctions. As most buyers who attend auctions understand this, there is never really a need to worry about this from a seller’s standpoint. You’re looking for a cash closing and the buyer’s expect to provide you one. It’s easy and reduces the likelihood of a deal falling through after the signing of the contract. The last pro I mention here falls in line really with the first pro of known date of sale/quick sale. An auction, by creating a known date of sale, allows a seller to eliminate holding costs that they may incur due to the normal expenses of owning property. Property taxes, maintenence fees and other costs can all be avoided by scheduling an auction before some of these normal recurring costs come due. Many of these costs may be incurred if one goes through the traditional method of listing property and it doesn’t sell as quickly as desired. The biggest con for a seller at auction is that there is a limited market. The same factors apply here against the seller that apply for the buyer as listed above. As the buyers must have cash or ready financing, many potential buyers are eliminated before you even begin. You are further limited by any number of other factors, such as weather, location, scheduling and others. As a seller, you ideally want to shop your property to as many buyers as possible to attain the highest possible price. Auctions can limit your pool of prospective buyers and thus can reduce what you may have been able to generate through a more conventional sale. You must get them to the auction and should your auctioneers do a poor job of marketing for the property, locate the auction improperly, or schedule it unwisely (like in the CSRA during Master’s) or should you even have bad weather, it could have a very del;eterious effect on your high bid price. 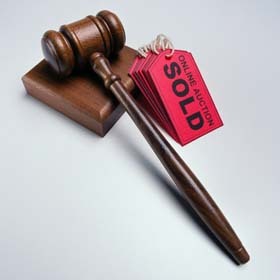 Certainly auctions can, and do bring high prices for real estate. I have been to numerous auctions where property sold for more than what I considered market value. Still, it doesn’t take much for your auction to be derailed and the seller pays the price. With some auction companies, the seller pays the advertising costs for the auction up front and recoups them through the buyer’s premium with a successful sale. However, should the auction produce a ready, willing and able buyer but the seller no sales the property because of an insufficient bid, the the seller will be out the advertising costs. This can be a very real cost as the auctioneers will usually suggest a very comprehensive advertising campaign in an effort to produce a sale and a successful high bid. There are also a couple of types of circumstances where the seller, based on his agreement with the auctioneer, may be liable for a commission to the auctioneer even in the event that the property does not sell. It is not entirely uncommon for seller’s to be liable to an auctioneer for a commission in the event that a seller no sales the property at auction. The seller can also potentially be liable for a commission in the event that they cannot produce good title to a buyer. As a seller you ned to make sure you know what you are agreeing to in your contract with an auctioneer before signing it. Check these provisions and make sure you know what you will be held responsible for if you believe you may need to no sale the property. Make sure you have good title to convey or determine what your liability will be if you can’t. So those are a few thing to mull over if you are intending to buy or sell at auction. This post, in addition to our previous post on auctions, certainly won’t make you an expert on auctions in Georgia, but it will give you some understandings of the basics. At least enough so that you won’t feel completely lost when you attend one. So have you had any experiences at auction? We’d love to hear them, either positive or negative experiences. Please leave any comments or thoughts you have in the comments section beneath the post, or you can got to our facebook fan page. You can find the link in the upper right hand corner. Also, as always, if you’re interested in buying or selling land in Georgia please fell free to go to our website. Ryan Brashear has been a licensed REALTOR® for 14 years specializing in land, farm and acreage sales in the CSRA. He is co-owner and Vice President of Brashear Realty Corporation as well as co-owner of Brashear Development Corporation. He has served as a Past President of the Greater Augusta Association of REALTORS® and is currently serving as a Vice President of the Georgia Association of REALTORS®. This entry was posted in Auction, Business, Georgia, Georgia land for sale, Investment, Real Estate Market. Bookmark the permalink. Thank you for listing the pros and cons of buying a property at an auction. My husband and I found a home that we would love to buy, but it is going up at an auction. We have never been to one and we don’t know what to expect. That is really nice that we can bid up to the point we are comfortable, and we can stop if we want to. I’m glad there isn’t a big commitment and we could possibly get a good deal. That’s a good point that you set the price at an auction. You can determine how valuable the land is. I’m looking for land for my new build home, so I might have to try an auction. My mother recently passed away and I am in charge of selling her house, so I am glad that I found this article. I had no idea that auctioning the house could have so many benefits like the fact that the sale will be quick and there will be an assured date of sale. This would definitely give me peace of mind because my siblings want me to sell the home as quickly as possible so that we can disperse the money evenly between the family.